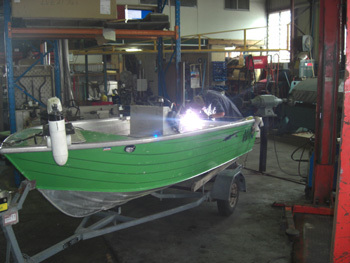 Sunshine Coast Marine Radiators, HEAT EXCHANGERS and shell and tube coolers. HEADER TANK HEAT EXCHANGERS - Sized to suit your needs. Our range of off the shelf marine coolers are versatile, robust and high quality. Our units are adaptable to fit a various range of engine sizes from 35kw (47hp) to 200 kW (270hp) from the four sizes of units we carry in stock. These units are shell and tube bundle combined with a header tank. This includes a pressurised filler cap and sacrificial anodes. We stock a range of shell and tube coolers to suit most popular requirements. Sandard sizes are available with copper tubes or marine grade copper nickel tubes. Casings are made of marine grade aluminium which are powder coated, end caps are stainless steel with anodes for corrosion protection different size end caps and connections are also available. 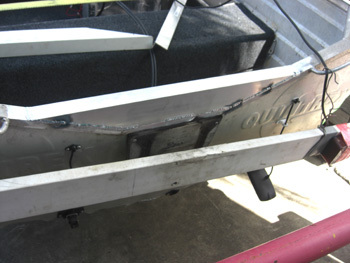 Hi Tech for all alloy boat welding and modifications.